Cellular shades are a wonderful option for those looking to reduce their home energy costs, but who don’t want to sacrifice on style. Thanks to their unique honeycomb pattern, they trap air before it reaches the interior of the house, helping to cut down on energy costs in all seasons of weather. Not only do cellular shades help insulate your windows, but they can also help to absorb sound from both inside and outside the home. It’s no wonder they’re such a popular choice among homeowners. Finding the best cellular shades for your home means reading reviews, studying product features, and diving into the ins and outs of available sizes and configurations. With the right cellular shades, you’ll not only save on energy, but your home will look good doing it. We reviewed dozens of cellular shades to identify the best of the best, based on Amazon reviews, how well they performed in operating tests, cost, and other considerations. We narrowed our search down to 5 of the top-rated cellular shades homeowners can purchase to ensure a stylish and healthy home. We’ve identified Achim Home Furnishings Honeycomb Cellular Shade as the best cellular shades out there. With a wide variety of sizes to choose from in several neutral colors, these cellular shades are one that will keep your entire home looking picture perfect. The Achim Home Furnishings Honeycomb Cellular Shade took the top spot on our list of the best cellular shades, thanks to the wide variety of sizes available, as well as the multiple neutral color options. We also liked that these cellular shades were available in corded or cordless options, and with the additional choice of a top-down bottom-up version. They boast a durable 100% non-woven polyester fabric construction, which is resistant to sagging and fading for added longevity. The cell size of ⅜-inch looks great in most sizes of windows. Those who purchased and reviewed these cellular shades appreciated the value for the price that these cellular shades provided, and found them to be smooth operating. Several people commented on how easy they were to install, and that the materials seemed sturdy. With an price tag starting from around $20, they are actually quite an affordable window treatment option, and the quality craftsmanship associated with the brand, as well as the ease of setup and use more than justifies that price. They have a rating of 4.5 on Amazon with more than 230 people reviewing them, which we think goes a long way in convincing homeowners to make the investment. The CHICOLOGY Cordless Cellular Shades Blackout Window Blind took the runner-up spot on our list of the best cellular shades, because although they are also available in a number of sizes and color options, they come at a markedly higher price point than our top pick. These cellular shades boast a cordless design with optional blackout backing for added privacy and use in bedrooms or media rooms. They are true to size, so you don’t have to worry about doing any math to ensure they’ll fit your window. Those who purchased and reviewed these cellular shades appreciated the insulating properties of these shades, as well as the fit and appearance. Some people found the installation instructions to be a bit lacking, but with some patience it shouldn’t be a problem to sort out. With an cost starting around $30, they are on the pricier side, and the pricing does quickly increase with larger sizes and blackout options. That said, the quality craftsmanship associated with the brand, as well as the ease of setup and use more than justifies that price. They have a rating of 4.5 on Amazon with nearly 100 people reviewing them, which we think goes a long way in convincing homeowners to make the investment. The Bali Blinds Cordless Light Filtering Cellular Shade is an excellent choice for those who are shopping for cellular shades on a budget, as they provide all the insulating benefits of their more expensive counterparts, but at a fraction of the cost. There are still a number of different sizes to choose from in this model, however, color is limited to white. They boast a cordless design which is ideal for homes with kids and pets, and offer both privacy and light filtering functionality. Those who purchased and reviewed these cellular shades appreciated that they were easy to install and use, as well as how durable the materials and construction are. Several comments mentioned that these shades were true to size, and found that even after a year or more they were still working perfectly. With an price tag of just $27-$38, these cellular shades are a solid choice for those looking for a cellular shades option on a budget. They have a rating of 4.2 on Amazon with more than 150 people reviewing them, which we think goes a long way in convincing homeowners that this budget-friendly pick is just as good at covering windows and insulating as their more expensive counterparts. The Calyx Interiors Cordless Honeycomb Cellular Shade is the best cordless cellular shade out there, and boasts one of the highest number of sizing options of any pick on our list. They are also available in a number of different colors to suit any decor. They can be mounted both inside or outside the window frame for added versatility and convenience. Those who purchased and reviewed these cellular shades appreciated that were easy to mount, and found that the measurements were spot on. People liked that there were bottom holding brackets to help secure the shade if desired, and several reviewers had been using these blinds over a year or longer with no issues. With a price tag starting from $13, they are incredibly affordable, and the quality craftsmanship associated with the brand, as well as the ease of setup and use more than justifies that price. They have a rating of 4.1 on Amazon with nearly 150 people reviewing them, which we think goes a long way in convincing homeowners to make the investment. The Arlo Blinds Single Cell Blackout Cordless Cellular Shades make an excellent choice for use in bedrooms or for shift workers who require complete darkness during the day. The blackout backing ensures that nearly no light gets through. They are available in a massive range of size options to suit nearly any window size, although color choices are a bit limited. Those who purchased and reviewed these cellular shades appreciated how well they fit and that they were simple to install. Even after several years of use, purchasers were still happy with these shades’ ability to block out light. Some people felt the plastic header looked somewhat cheap, but this can easily be covered with a valance. At a cost starting about $42, they don’t come cheap, but the quality craftsmanship associated with the brand, as well as the ease of setup and use more than justifies that price. They have a rating of 4.7 on Amazon with more than 120 people reviewing them, which we think goes a long way in convincing homeowners to make the investment. Cellular shades are an ideal choice for those looking to reduce their home energy costs, but who don’t want to sacrifice on style. Thanks to the unique honeycomb pattern in cellular shades, they trap air before it reaches the interior of the house, and reduce energy costs in both hot and cold weather. Not only do cellular shades block heat and cold, they also protect against damaging UV rays. If you’re looking for more options to keep your living space warm, check out our reviews of the best space heaters and the best electric fireplaces and stoves. Cellular shades are also a good pick for noisy areas. Their design helps dampen sound, and double cellular shades are particularly effective at this task. This sound absorption ability is nice for street-facing windows to help increase the peace within your home. Finally, if you’re considering selling your home in the near future, window treatments can make a big difference in the finished appearance of your home, and cellular shades offer the most neutral look for current decor and future remodels. Dimensions. Arguably, the most important consideration when it comes to purchasing cellular shades is the dimensions. You want shades that will fit your entire window. The best way to ensure a good fit is to measure well, or, have a professional measure your space to create custom shades. Corded vs cordless. Although there are still some corded cellular shades available on the market, the majority of manufacturers have switched to cordless designs in order to comply with safety regulations. That said, when given the option it is best to go with cordless cellular shades as they eliminate the risk of strangulation — especially important in homes with young children or pets. Cell type and size. Cellular shades come in single cell, double cell, or triple cell designs, and their pricing varies accordingly. Single cells are lightweight and ideal for large windows. They don’t provide as much insulation or energy savings as double or triple cell styles, but are still a good option. Cell sizes are available in 3/8”, 1/2”, 3/4″, 9/16”, 2” options. The size of the cell determines the width of the pleats, with smaller cells being ideal for smaller windows and larger cells the better choice for large windows. Style. 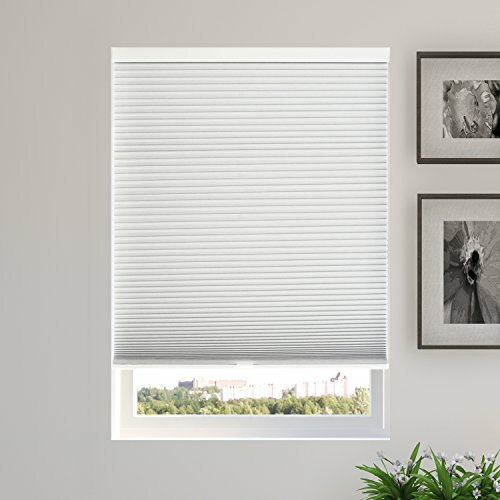 Consider the look and decor you’re wanting to achieve with your cellular shades. Color, texture, and pattern are all various options to choose from and come down to a matter of personal taste. Features. Cellular shades are available with a number of useful features that make them a popular and practical choice. Options such as blackout backing, motorization, or top-down bottom-up functionality are important considerations when choosing the best cellular shade for your space. Price point. Finally, consider how much you are willing to spend on cellular shades. Cellular shades vary in price from $40-$1000 or more. Keep an eye out for manufacturer’s sales, coupons, or discounts that can make buying cellular shades more affordable. What are cellular shades and how do they work? Cellular shades are a type of window covering that uses a cell to block light and insulate windows. They are also sometimes called honeycomb shades thanks to their unique honeycomb shape (easily viewed when looking at the end of the shades down the cell), and come in single cell, double cell, or triple cell designs. Cell size can vary, but cells act as an insulator between hot and cold air inside and outside the home. Can you clean cellular shades? Yes! You absolutely can clean cellular shades. First, remove any dust from your shades by spraying compressed air down the cells. Then, use the brush attachment of a vacuum to lift any dust and debris from the surface of the shades, or continue with the compressed air blowing up and down the surface of each cell. You can also use a microfiber cloth or lint roller for this task. Next, clean the mounting and tracks of your shades, as well as any ingrained dirt or stains by wiping them with a cloth dipped in warm, soapy water. Can you see through cellular shades at night? No, you cannot see through cellular shades at night. In fact, their unique design makes them one of the best options for spaces where privacy is desired. If you are concerned about light coming in from outside, you can purchase cellular shades with a blackout backing that blocks all light. This makes them an ideal choice for media rooms, and bedrooms — especially for those who must sleep during the day. Cellular shades are very energy efficient, making them a popular choice among homeowners looking to cut down on their home energy costs. Thanks to the unique honeycomb pattern in cellular shades, they trap air before it reaches the interior of the house, and reduce energy costs in both hot and cold weather. We looked at 20 other cellular shades. Even though they didn’t make our 5 best cellular shades list, they’re the best of the rest and each is still a great option for your home. The information you’ll need to compare each one is included with the listing. These cordless cellular shades boast a wrinkle-free design, and can be mounted inside or outside the window frame for added versatility. These cordless cellular shades boast a neutral, light filtering design, and can be mounted inside or outside the window frame for increased versatility. The white backing makes for a clean look from outside the home as well. These cordless cellular shades boast a durable polyester construction, and are light filtering to help block out harmful UV rays. They can be mounted both inside or outside the window frame. These cordless cellular shades boast a convenient top-down bottom-up design, and are light filtering for increased energy efficiency. These cordless cellular shades boast an easy to install design in a clean and sleek package. They come complete with all mounting hardware, as well as top and bottom rails. 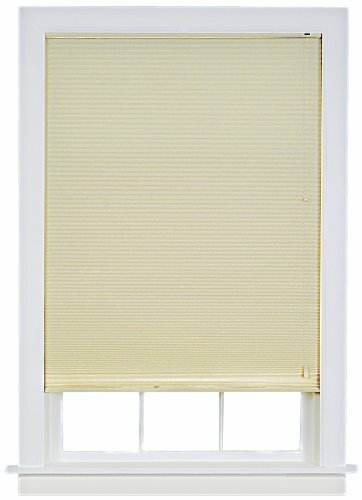 These cordless cellular shades boast a clean, neutral design and come complete with color matched fabric, headrail, end caps, and bottom rail for a cohesive look. These cordless cellular shades boast a unique design that can be cut to custom-fit any size window, and are available in a choice of light filtering or room darkening options. These cordless cellular shades boast a unique design that doesn’t require any tools to install — just a couple of minutes and the push of a button is all it takes for instant light filtering and insulation on your windows. These cordless cellular shades boast a simple installation method — simply peel and stick them where you need them! Ideal for renovations, dorm rooms, and short-term stays. These cordless cellular shades boast an EZ glide top-down bottom-up system, and feature a ½-inch honeycomb cellular fabric design that helps filter light and UV rays. These cordless cellular shades boast a light filtering 9/16-inch honeycomb design, and come complete with color matched fabric, headrail, end caps, and bottom rail for a cohesive appearance. These cordless cellular shades boast a 100% polyester spunlace non-woven fabric construction that is both durable and effective at filtering light and insulating against hold and cold temperatures. These cordless cellular shades boast a beautiful light filtering fabric which helps aid in energy efficiency. They are simple to clean with just a small cloth, feather duster, or vacuum using the soft brush attachment. These cordless cellular shades boast a practical top-down bottom-up design, and are meant for inside mount applications. They provide sound absorption, light filtering, and energy efficiency. 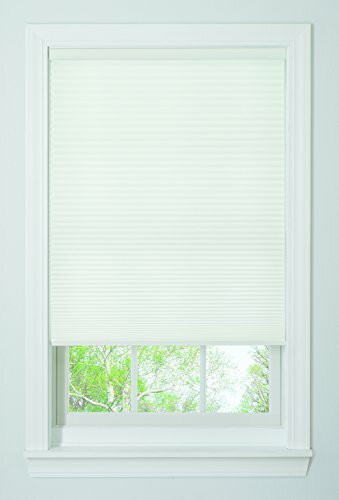 These blackout cellular shades boast a white backing which provides a clean look from the outside of the home, and is accepted by most Homeowners’ Associations. 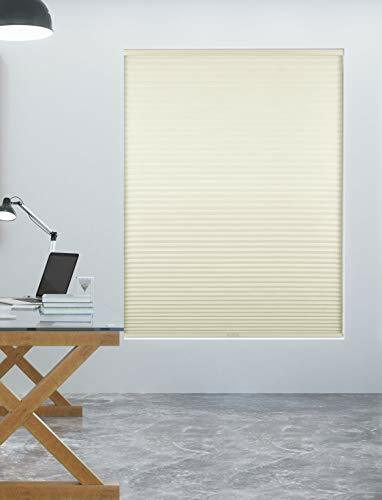 These blackout cellular shades boast a unique design that can be trimmed to fit nearly any window, and require no special tools for installation. These blackout cellular shades boast a top-down bottom-up design, and are cord-free, making them ideal for use in homes with children or pets. These blackout cellular shades boast a light filtering design that is ideal for use in bedrooms and media rooms, and provide a crisp, clean look. 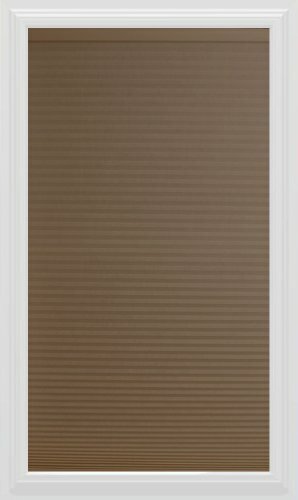 These blackout cellular shades boast a unique cut-to-fit design that makes them suitable for use in windows of all sizes, and are constructed from high quality non-woven polyester fabric.